Posted on August 4, 2018, by Daphna Baram & filed under News. This month, 53 structures were demolished in the occupied Palestinian Territories (including East Jerusalem) displacing 97 people- including 55 children- and affecting a further 644 people, including 292 children. Inside Israel, 11 houses were demolished in Arab-Palestinian cities, displacing dozens of people, and in the Naqab desert, the unrecognised Bedouin village Al-Araquib was demolished for the 131st time. 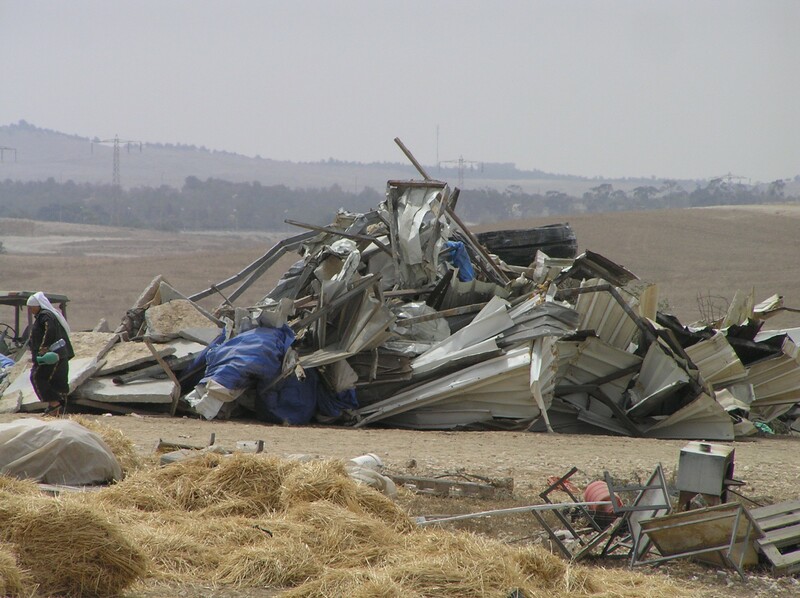 On 2 July, 2018, Israeli forces demolished a barn in Umm Tuba, East Jerusalem, affecting 2 people. On 2 July, 2018, Israeli forces demolished a car wash in Ras al ‘Amud, East Jerusalem, affecting 1 person. On 2 July, 2018, Israeli forces demolished a structure in Ras al ‘Amud, East Jerusalem, affecting 11 people from two households. On 2 July, 2018, Israeli forces demolished a structure in Ras al ‘Amud, East Jerusalem, affecting 9 people from three households. On 2 July, 2018, Israeli forces demolished a structure in Battir, Bethlehem, affecting 19 people from two households. On 3 July, 2018, Israeli forces demolished a 120-square meter house in Battir, Bethlehem, displacing a family of eight. On 3 July, 2018, Israeli forces demolished a structure in Al Khadr, Bethlehem, affecting 13 people from three households. On 4 July, 2018, Israeli forces demolished a water tank provided as humanitarian assistance, in the herding community of Al Farisiya-Khallet Khader, Tubas, affecting access to water for 148 people from 22 households. On 4 July, 2018, Israeli forces demolished 19 structures, including nine homes and agricultural structures in Abu Nuwar, Jerusalem Periphery, affecting 19 people from three households, and displacing 51 people from nine households. On 5 July, 2018, Israeli forces demolished five structures in Hizma, East Jerusalem, affecting 29 people from four households. On 5 July, 2018, Israeli forces demolished a house in Susiya, Hebron, displacing a family of five. On 8 July, 2018, Israeli forces demolished four houses under construction in Umm al-Fahm, North Israel. On 10 July, 2018, Israeli forces demolished two houses in Qalanswa, North Israel. On 11 July, 2018, Israeli forces confiscated two structures that were supposed to be used as an elementary school in the rural community of Khallet Athaba’, Hebron, affecting 33 people. The confiscation has left the community’s children with no school structure for this upcoming school year. On 15 July, 2018, Israeli forces demolished two residential structures in Khirbet al-Marajim, Nablus, affecting 23 people from four households. The families received a demolition order a week earlier and submitted objections to an Israeli court, however they did not receive any reply from the State. One house was built four years ago, and the other some 30 years ago. On 17 July, 2018, Israeli forces demolished a structure in Al Walaja, Bethlehem, affecting ten people from one household. On 17 July, 2018, Israeli forces demolished two structures in At Tur, East Jerusalem, affecting nine people from one household. On 17 July, 2018, Israeli forces demolished three structures in Shu’fat, East Jerusalem, affecting six people from one household. The house, an agricultural structure and a wall were all demolished with no prior notice. This is the second time Saleh abu Khdeir, owner of the house, has had his home demolished, after Israeli forces demolished his home on February 2018. On 18 July, 2018, Israeli forces demolished four structures in Isteih, Jericho, affecting 1 person from one household and displacing a family of six. On 18 July, 2018, Israeli forces demolished a structure in At Tur, East Jerusalem, affecting nine people from one household. On 18 July, 2018, Israeli forces demolished two houses in al-Duyuk at-Tahta, Jericho. On 18 July, 2018, Israeli forces demolished four houses in Lod, Central Israel. The demolition displaced around 40 people. On 19 July, 2018, Israeli forces demolished two structures in Beit Hanina, East Jerusalem, displacing 19 people from four households. On the same day, 19 July, 2018, also in Beit Hanina, East Jerusalem, two Palestinian families self-demolished their homes, after they lost in a court case that was going on for several years now, in which Israeli settler Ariye King had claimed ownership on the land the houses were built on. After the court handed its decision and ordered the families to evacuate the land, they decided to demolish the houses rather then seeing Israeli settlers move into them. As a further act of resistance, the families have set up tents next to the demolished houses and are residing in them currently. In addition, the court fined both families for building without an Israeli-issued building permit (the houses were built 17 years ago), it fined one family 75,000 NIS and the other 120,000 NIS. On July 23, 2018, Israeli forces demolished a house in Sakhnin, North Israel. On 25 July, 2018, Israeli forces demolished a kindergarten and a women’s centre in the Bedouin community Jabal al Baba, Jerusalem Periphery, affecting 290 people from 58 household. On 26 July, 2018, Israeli forces demolished the unrecognised Bedouin village of Al-Araquib for the 131st time since June 2010. On 30 July, 2018, Israeli forces demolished an animal pen in Yatta, South Hebron Hills, leaving the family of herders with no shelter for their livestock. The family was further ordered to pay several thousands of shekels as a fine for building without an Israeli issued building permit. On July 5, 2018, UN officials released a statement calling for an end to West Bank demolitions and respect for International Law. Yesterday, Israeli forces began levelling access routes in the Palestinian Bedouin community of Khan al Ahmar-Abu al Helu, home to more than 180 people, 95 per cent of whom are Palestine refugees. The work comes in advance of the expected demolition of the entire community. Israeli forces injured thirty-five Palestinians and arrested others, including residents, in confrontations that ensued while bulldozers were levelling all entry and exit points. One Israeli soldier was also reported injured as well. Today, the Israeli authorities have declared Khan al Ahmar a closed military area, and are heavily restricting movement of residents and preventing the entry of others to the community. This situation occurs on the backdrop of a wave of demolitions across the West Bank in recent days. Since 1 July, eleven incidents have occurred, displacing 59 Palestinians, including 37 children, and affecting more than 200 others. Included within this is the demolition of 19 structures, including nine homes, in the Palestinian Bedouin community of Abu Nuwar (around 600 residents, 88 per cent Palestine refugees). As a result, 51 people, including 33 children, were displaced and another 13 people, including five children, who had family property destroyed, were directly affected. Also, one home was destroyed today in Susiya, displacing a family of five. International humanitarian law (IHL) requires an occupying power to protect the population of the territory that it occupies, ensure its welfare and well being, as well as the respect for its human rights. Any destruction of property by the occupying power is prohibited, except when rendered absolutely necessary by military operations, which is not relevant in the West Bank where there are currently no active hostilities. The extensive demolition of property, not justified by military necessity and carried out unlawfully and wantonly, may be a grave breach of the Fourth Geneva Convention and may amount to a war crime. Other than for the security of the population or imperative military reasons, IHL further prohibits the transfer of the population of an occupied territory without the genuinely and fully informed consent of the affected people, regardless of the motive. Consent is not considered genuine in an environment marked by the use or threat of physical force, coercion, fear of violence or duress. In the absence of such consent, the transfer is forcible and constitutes a grave breach of the Fourth Geneva Convention.